Resideo acquired Buoy! Learn more here. A smart home for your water. Leak? Shut off your water remotely, or automatically. Budgeting? Data helps you use water where it matters most. Question? Our support team answers the phone every day. Emergency? Get a plumber's help 24/7. Buoy is $299, including installation by a licensed plumber, and $17.99/mo (paid annually). The kids left the hose on and it had a drip. Buoy found it! Thanks! Buoy showed me how much more water we used washing dishes by hand than using the dishwasher. I always thought hand washing was more efficient! What Tesla has done for the electric vehicle, Buoy's done for water. It's an extraordinary product. Buoy sent me a leak notification when I was at work and I immediately shutoff my water. When I went home, I discovered a significant leak in pipe on the exterior wall of my daughter’s room. Buoy caught a leak in my new irrigation system the first day it was installed! Buoy saw the toilet running in my guest bathroom: 150 gallons/day and double my regular daily water usage. Remote shutoff while camping allowed me to stop a dripping faucet and gave me peace of mind all weekend. I used remote shutoff from work, and it saved me from wasting about 1,500 gallons of water because of a stuck toilet flapper. I mean holy crap, that's literally thousands of dollars a year. I wonder how long this thing has been shooting water into the air!?!??! My washer overflowed and I had to close the valve as the water kept running even after turning the washer off. The issue with washer has been resolved and Buoy prevented a major disaster at my home. Install Buoy on your main water line near your home's water shutoff valve. 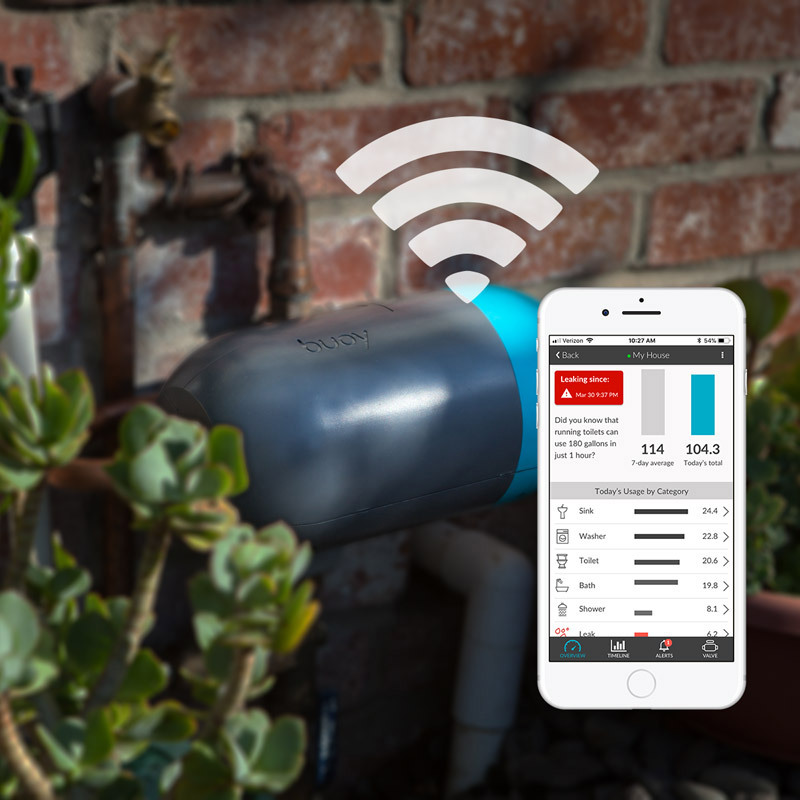 Buoy's sensors detect even the smallest water use, and when you connect it to WiFi, Buoy will send your water use data to the app. Homes typically lose 10 percent of their water to slow leaks, so you’ll see how your home stacks up. The app shows you how much water you use to shower, do laundry, and keep your lawn green, and you can shut off your water remotely or automatically. When there’s a leak, you get an alert, so you can shut off your water remotely and contact a plumber from the app. Buoy can also shut off your water automatically, preventing costly water damage and giving you peace of mind. D What is a Buoy?